The Rt. Rev. 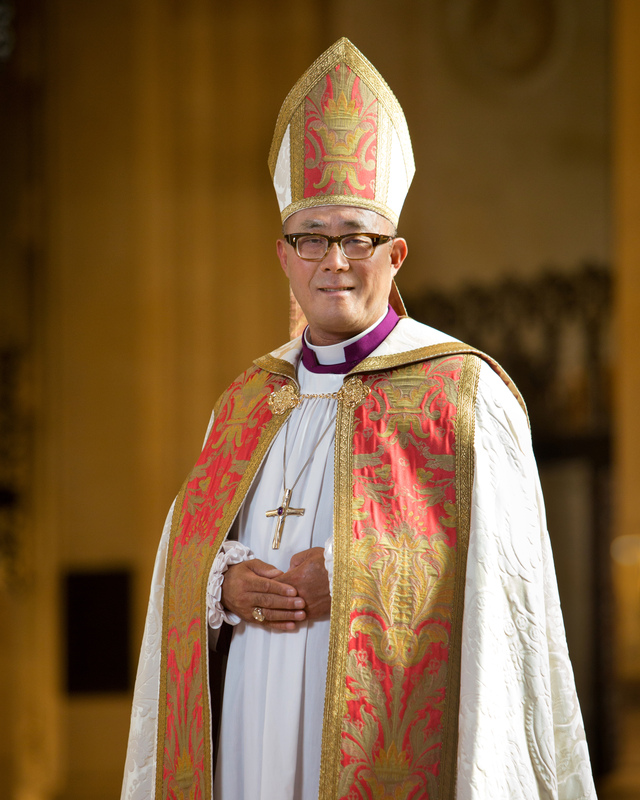 Allen K. Shin was elected to be the diocese’s new bishop suffragan on December 7, 2013, at a special election convention held at Manhattan’s Cathedral Church of Saint John the Divine, and was consecrated at the Cathedral on Saturday May 17, 2014. Born in South Korea, Allen K. Shin and his family moved to Washington, D.C. in 1972, where he attended Gonzaga College High School, a Jesuit school for boys. He earned his Bachelor’s degree from Eastern Michigan University in 1983, majoring in Music/Vocal Performance. He then spent four years in New York City working as a professional singer, before taking up a position as a choir director at a Korean Episcopal church in Chicago. Having gone through the discernment process in Chicago, Shin studied for his Master of Divinity degree at the General Theological Seminary in New York City, graduating in 1996. He was ordained to the diaconate in the Diocese of Chicago in June of that year, and to the priesthood in the Diocese of New York that December. Also in 1996, he was called as Curate/Assistant to the Church of St. Mary the Virgin in New York City, where he remained until 2001, at the same time taking up the position of Assistant Officer, Episcopal Asiamerica Ministry at Episcopal Church Center, which he held until 1999. In 2001, he earned the degree of Master of Sacred Theology from the General Theological Seminary. He then went to England, where from 2002 to 2005 he pursued post-graduate studies in Patristic Studies at the University of Oxford. During the course of his studies, he also held the position of Honorary Assistant Priest at All Saints Church, Margaret Street, London. He then remained at the University of Oxford from 2005 to 2010 as Fellow and Chaplain of Keble College. Shin returned from England to the United States in 2010, to take up the position of Rector of St. John’s Church, Huntington, NY, in the Diocese of Long Island. Click on the image to view/download a high definition version.